Continuing a line almost due south of Burgundy lie the vineyards of the Rhône valley. This is an area of contrast. In the North, some of the world’s longest-lived wines are produced: rare and aromatic whites; tannic and massively structured reds. In the South, a veritable sea of hearty everyday red is produced, but so too are the famous and high quality wines of Châteauneuf-du-Pape and Gigondas, as well as sweet wines of high quality. The Rhône river begins life way to the north in Switzerland. As it makes it way down through the length of France it widens to become the central feature of the Rhône valley, which spans roughly between Lyons and Avignon. The Rhône valley divides neatly into north/south regions at the town of Valence. The Northern Rhône is a land of steep, steep slopes carved into granite hillsides by the progress of the river over thousands of years. Vines cling to near vertical surfaces, or terraces carved into the rock. It is predominantly a red wine area, but some rare and expensive whites come from here. Towards the south, the steep slopes give way to a broad valley floor which is baking hot in the summer. An enormous quantity of mediocre red wine is produced, but pockets of superb quality exist. Marsanne and Roussanne are also grown for white wines. Grenache Blanc, Picpoul, Roussanne and Marsanne for whites. Along with those in Germany’s Mosel valley, the vineyards here are amongst the steepest and most difficult to work in the world. The Northern Rhône’s finest wines are the Syrah reds: also some of the world’s greatest wines. The winemakers of the north are largely family-owned concerns who have worked these daunting slopes for decades. The famous wine of Hermitage takes its name from the hill of Hermitage above the town of Tain. These are historically regarded as the “manliest” of French wines. Deep, dark and serious, these wines are strapping, tannic and vigorous in youth, developing complexity and finesse as they age over 20 years or more. White Hermitage is also produced, from Marsanne and Roussanne grapes. Côte-Rôtie is an unusual red wine that may contain up to 20% of the white Viognier grape in its blend. This is rarely done however, more often the wines are 100% Syrah, perhaps with a dash of Viognier. Côte-Rôtie shares some of the character of Hermitage, but is generally more approachable when young, is more aromatic, and has a more graceful appeal. Look out for Crozes-Hermitage, a more easily available wine made from less formidable slopes around Hermitage. It is a Syrah with some of the quality, but at a fraction of the price. The co-operative of Tain l’Hermitage has a good reputation. St-Joseph and Cornas are other Syrahs with strong personality at a fraction of the price of Hermitage. The vineyards sit on the opposite bank of the river. The north is also the home of rare and expensive white wines made from the Viognier grape, such as Condrieu and Château-Grillet. These wines are clean and highly aromatic yet at the same time powerful and full-bodied. They are also very expensive and can be very long lived. Château-Grillet is highly unusual in that it is an Appellation Contrôlée that is under the ownership of only one producer. Top producers include: Guigal, Jaboulet, Chapoutier, Chave, Grippat. 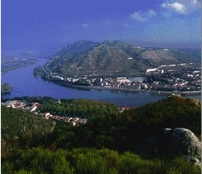 The Southern Rhône is mostly known for its red wines. These include famous names like Châteauneuf-du-Pape, but the area is perhaps best known for the less expensive wines of the Côtes du Rhône. This Appellation Contrôlée actually encompasses the Northern Rhône too, but the vast majority of wine is produced from the flat, arid plains of the south. Quality is highly variable. A vast amount of light, easy-drinking wine is made, sometimes using the technique of carbonic maceration found in Beaujolais. Look out for Côtes du Rhône-Villages, which comes from the best 17 villages of the area. Rather like the Beaujolais Villages, the best are sometimes labelled with the village name, Côtes du Rhône appearing only in tiny print: Cairanne, Sablet, St-Gervais, Seguret, etc. These should be superior wines, spicy, strong and suitable candidates for 5 to 10 years cellaring. They have lower yields and higher alcohol than the basic appellation. Whites in the south tend also to be blends. Modern techniques mean they are usually fresh and enjoyable. The name Châteauneuf-du-Pape means “The Pope’s new castle”, a reference to when nearby Avignon became the home of the papal court in the 14th century. No fewer than 13 grape varieties are permitted in Châteauneuf-du-Pape, which is easily the leading wine of the Southern Rhône. In theory this means the wine-maker has various options at his or her disposal each vintage depending on how individual grape varieties have performed. In practice, most Châteauneuf-du-Pape is made up of the 3 highest quality grapes: Grenache, Mourvèdre and Syrah. This is a wine which is invariably high-alcohol, heady and rich. The best Châteauneuf is usually estate bottled. Such wines are easily distinguished by the papal coat of arms embossed on the neck of the bottle, though this should not be considered a gaurantee of quality. Some, but by no means all, of the vineyards of Châteauneuf-du-Pape are distinctive in that the earth is strewn with a deep layer of large, rounded stones known as “galets”. The galets are said to retain the heat of the sun which helps in the ripening process. This may be true, but many fine properties have soils without a galet in sight, yet they produce ripe and healthy wines. The wines of Gigondas and Vacqueyras are built in a similar style to Châteauneuf-du-Pape and can offer high quality, often substantially cheaper than their famous neighbour. There are some very good wines being made in outlying appellations within the Rhône valley. I have been impressed by the red wines of Costières de Nîmes as well as some examples from Coteaux du Tricastin and the Côtes du Lubéron. A good deal of quality fortified sweet wine is made too, the most famous example being the Muscats of Beaumes-de-Venise. These are “Vins Doux Naturels”, that is they are fortified wines, made by adding spirit part way through fermentation. This produces a wine that is high in alcohol and sugar, and is dominated by grapey flavours. I’ve had mixed experiences with these once again: the best producers making delicate, finely balanced wines, others being sweet and luscious but also rather raw and alcoholic. One grape that is arguable star of the wines of the Rhône has also taken the New World by storm. The Syrah grape is a huge success story in certain regions, notably Australia, where it is known as the Shiraz and is perhaps their leading red wine grape. Australian Shiraz has a family resemblance to the great Syrahs of the Northern Rhône, but it is usually made in a more vividly fruity, earlier-drinking style. Often these are “blockbuster” reds, with bags of fruit, spice, chocolate and peppery flavours. The Australians still market Shiraz as “Hermitage” in Australia, but that term is forbidden in EEC countries. Leading Shiraz areas include the Barossa, Clare and Hunter valleys, and top producers include Penfolds, Tim Adams, Henschke, St Hallett, Yarra Yering, Jim Barry and Peter Lehmann. California and South Africa are also making some superb wines from the Syrah, the style is often somewhere between the Rhône and Australia. Southern Rhône blends are also popular in Australia and California. Mostly Mourvèdre and Grenache based, there’s even a first class wine called Nine Popes (a punny translation of Châteauneuf-du-Pape) made by Charles Melton. Australia and California are also producing some excellent Marsannes, Roussannes and blends. The Marsanne in Australia reaches great ripeness and produces a wine that is peachy, full-bodied and delicious, but high in alcohol. Good producers include Michelton, Thomas Mitchell and Tahbilk at around the £5/$8US mark. California is making some very good Viognier wines too, the best finding small areas with micro-climates not unlike the Northern Rhône. These wines are also rather high in alcohol (necessary to achieve optimum ripeness) but can offer a really unusual white wine experience. Fetzer Vineyards, from the cooler Mendocino area, makes a fine example. (The South of France is also planting a lot of Viognier currently – look out for some of the Vin de Pays bottlings).